Congratulations on the arrival of your baby! 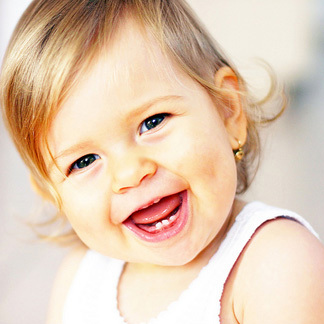 Are you prepared for the arrival of your baby's first tooth? Our practice welcomes your little one and encourages these guidelines so that he or she will be on the way to a lifetime of healthy smiles! When a few more teeth appear, you can start using toothpaste with your child's brush. However, for the first two years, be sure to choose toothpaste that does not contain fluoride, unless advised to do so by your dentist, because too much fluoride can be dangerous for children under two. At this stage, use only a tiny amount of toothpaste. From the beginning, have your little one practice spitting the toothpaste out after brushing to prepare for fluoride toothpaste, which should not be swallowed at any age. We recommend that you bring your baby in for a visit within six months of the first tooth's eruption – usually around his or her first birthday. Since decay can occur in even the smallest of teeth, the earlier your baby visits us, the more likely he or she is to avoid problems. We'll look for any signs of early problems with your baby's oral heath, and check in with you about the best way to care for your little one's teeth. Remember that preparing for each dental visit with a positive attitude goes a long way toward making your child comfortable with regular checkups.